Let others wonder what dangers lurk within the shadows: you learned long ago that the true power is shadow itself. Through deep study and practice—or a long-ago mark on your bloodline—you can draw mysterious, unsettling energy from the alien dimension known as the Shadow Realm, and turn it to your own use. Those who fear the shadows, also fear you. Let them. A new monster to conjure: the shadow mastiff! Where darkness brings dread to others, for you it brings a fierce joy and a surge of power. The shadows are your dominion; and by drawing upon them, you become a force to be reckoned with. 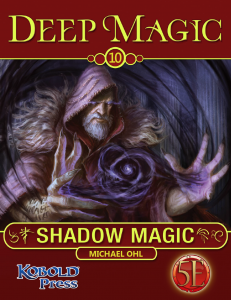 Get Deep Magic: Shadow Magic from the Kobold Store today! Wouldn’t it just use the regular Mastiff stats with the creature origin changed to undead? Shadow Mastiff is in the Volo’s Guide to Monsters. Are you able to use these spells on any class or just the ones that have archetypes in the book.